I am a resident, taxpayer, and a voter in the town of Los Altos, California and the 4th generation in my family to live in this town. I have proudly voted in every election since I turned 18 in the summer of 2009. I offer a voice for the millennial generation on the bond that would establish a 55,000 square foot civic center and 3-pool complex at Hillview Park, and I am writing to express my disapproval of such a bond measure. Firstly, there is no concrete plan for how this community center will be used. So much information is floating around about the process, while the city council admits that there is not a full plan in place for how the space will be utilized by stakeholders in the community. Given the lack of strategic outline, it seems senseless to ask the taxpayer to fund an 87 million dollar endeavor while so much remains unclear in the process. The development of three new pools seem fiscally irresponsible and morally questionable in the context of our state’s drought, which has lead some California cities to ban the building of any pools. There is also a question as to who really benefits from the pools, particularly, since the schedule in the Environmental Impact Report shows approximately only two hours available for recreational swim, that happen to be in the middle of a normal work day. Don’t we have underused pools, like at Los Altos High School that we can tap into? Is the demand for pools so large that we really need three? Is the demand for space so great that we require 55,000 square feet of space larger than our new Safeway? Throughout this whole process, the city council has seemed to ignore the attitudes of my generation. As millennials, we value innovation, collaboration, technology, sustainable development, and dissemination of knowledge. National trends show that our generation fuels the economic growth, public image, and development of cities across this country. 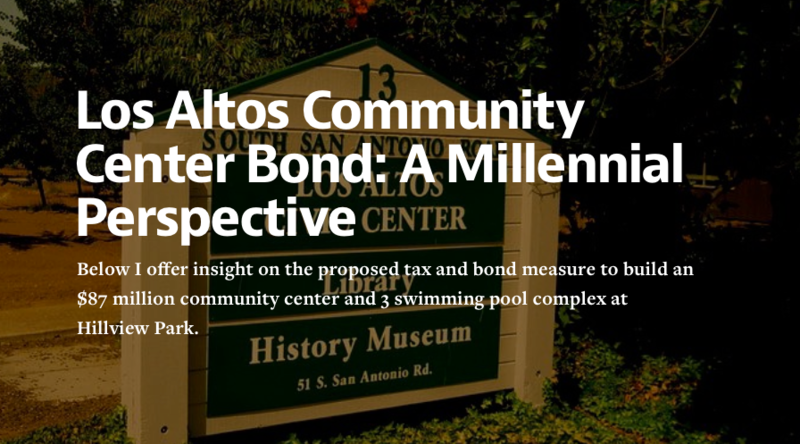 Disregarding what attracts us to a city as well as what our generation cares about could be detrimental to the growth and perception of Los Altos. With this bond measure and the looming threat of many more to come (As this bond does nothing to improve the facilities of the library, police station, or city hall), the property taxes in this city will continue to rise for the next 30 years. As a fourth generation resident of this town, I hoped to one day start my own family in this community that gave me so much. But the frivolous, unstructured spending portrays an image of irresponsibility and unaccountability in the city government. Starting my own family in this town now seems like a financially risky decision. Evident on social media (Twitter, Facebook, Tumblr, etc), this economic and political context is unattractive to others in my generation as we seek out communities to establish our own roots. Let’s be creative, innovative, and strategic. Let’s use what we have instead of reaching more into the taxpayers’ pockets. It’s time to go back to the drawing board and develop a sensible, cost-efficient strategy that benefits all citizens rather than special interests groups. Citywide Community Survey data results to prioritize important facilities and expenditures continually put Library, Parks, Open Space, Safety/Police, and other City services at the Top of the List. 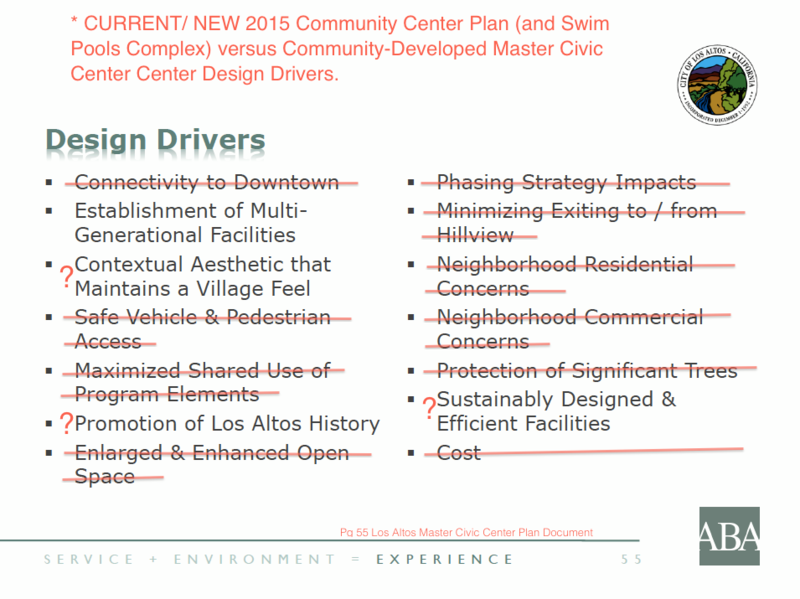 What was at the bottom of the list, and considered NOT A PRIORITY or important for the community ----Swimming Pools. And yet they are fixed to this location and Hillview Community Center project. Neighbors provide community insights and perspective on topics related to Measure A and the Hillview Community Center project and City planning.